Vega Helmet Corp. is recalling more than 30,000 XTS motorcycle helmets after doing a test and found that some did not meet crash protection safety standards. NHTSA said that people using the helmets may not be protected in a crash. The recall will start in January. NHTSA has told Vega that 4 extra large helmets didn’t meet the safety standards when tested this year. The company started to investigate and found that the helmets fell out of compliance partially due to changes in models shell design. Vega has no stats so far as to how many helmets will be recalled, so they did the right thing and recalled all of them. The 5 months that our blog was up went by very fast. We are taking this time to Thank Everyone for following eBikerLeather Blog. Check out our stats below, next year we hope to do full year and receive better stats then we have received in 2012. Stay connected with us, on the latest news, events, videos, pictures, and much more from around the world. As you have noticed we have not been keeping up with our regular postings on the blog. 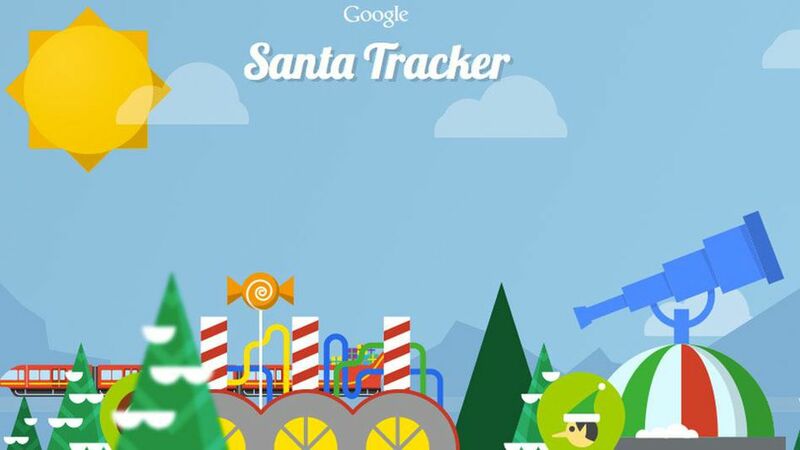 It is hard to keep up with everything that is going on now, with the holidays. I will try to do my best in updating the blog more than once a day after new year’s. Each Friday we were supposed to add a biker chick of the week. However, we have missed 2 Fridays already, and this is the last Friday in 2012! It is time to catch up with our biker chicks. 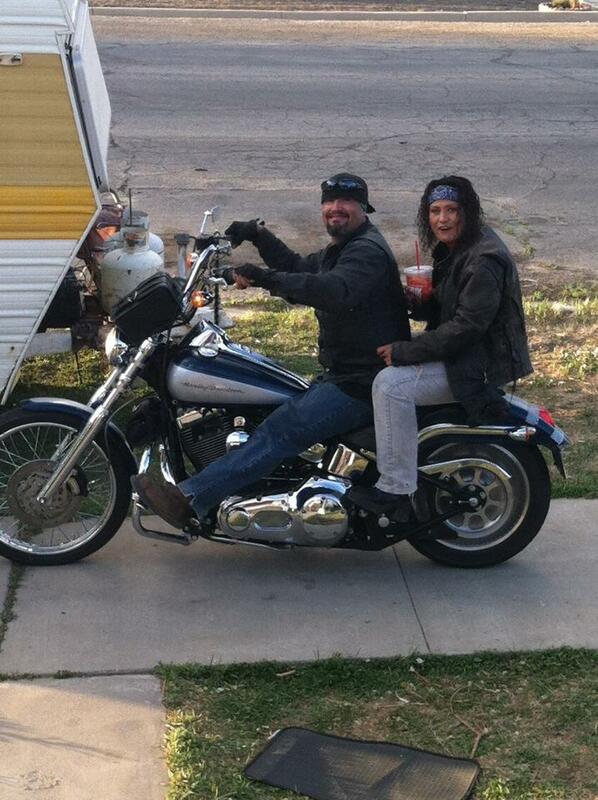 Our first biker chick of the week is Gwenda with her 2005 chopper / bobber, SnS 113ci. She loves her baby; on the second picture we have Gwenda and her good buddy Nick. 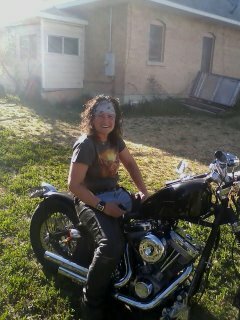 Our second biker chick of the week is Little Wing. She is the president of 5280 Ladies, and send everyone big hugs. 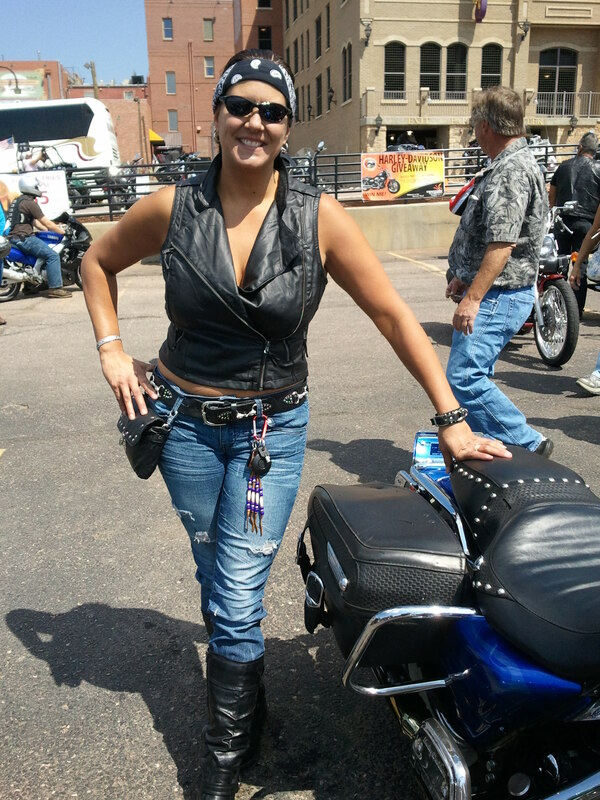 Our third biker chick of the week is Heather from Denver, Co. Her passion is riding, and 2002 Harley Road King. She has been riding for over 30 years! 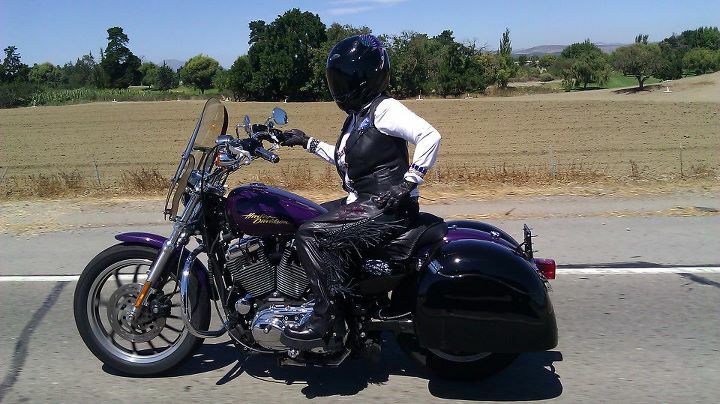 Thank you ladies for submitting your pictures to eBikerLeather.com! Express your love and freedom with your story; submit your story today! Tell us your story of meeting new friends, learning to ride, and any other story that has to do with motorcycles. We will publish each story in the correct category Men and Women Freedom Riders for everyone to read. Keep us updated on your adventures from life, and experiences while riding. There is nothing better than reading a great biker story with a coffee in the morning. A day I probably spend about 1 hours looking at custom bikes out of my schedule. I love to read about motorcycles, and their customizations. 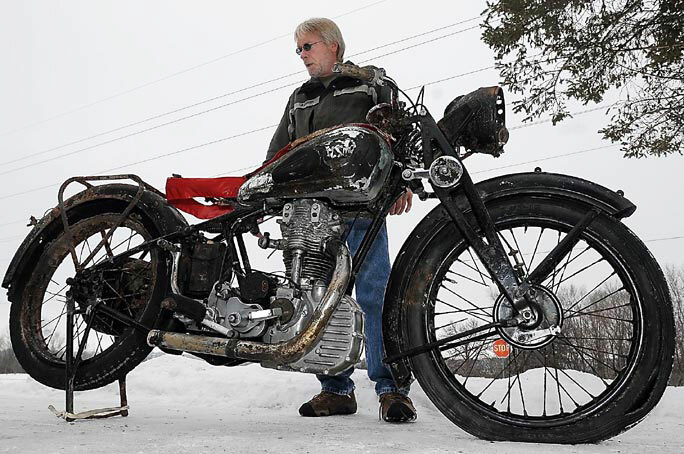 Taking one bike and representing it as another bike, which is the goal of presenting the best custom motorcycle. Today’s custom Harley Davidson Dyna is made by Roland Sands Designs. The way they have maintained the view of the bike so it does not jump far away from its original design and is far best of their work? The story of sunken 1938 NSU 251 OSL. Have you experienced the joy of being reunited with your motorcycle? I have not, but if you count traveling away from home, then yes. However, that is not the same experience as Dean, had with his motorcycle. 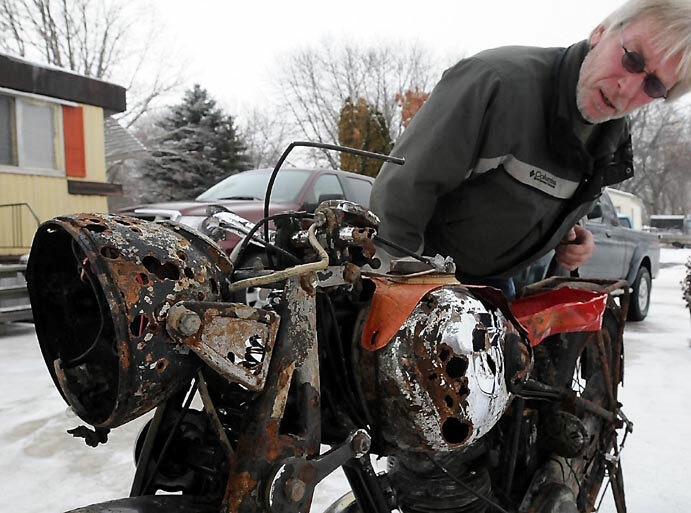 The motorcycle was fished out from a lake in Minnesota, and it is almost 56 years after the German motorcycle sank to the bottom of the lake. Motorcycle was bought in 1956, by Wyman Ailie for his son Dean. During the winter season Dean was coming back from his friends house and decided to take a shortcut across frozen surface of Big Swan Lake in Dassel, Minnesota. Even that Dean was careful the ice cracked under him and his ride fell into the water. Ailie was rescued by fisherman, and his leather jacket that kept him from drowning. Last month on November 29th, 2012 the motorcycle was fished out by commercial fisherman. Now Ailie is 71 and lives near by the lake, and has been reunited with his motorcycle. Merry Christmas from eBikerLeather Crew!